Badminton is a very popular sport. 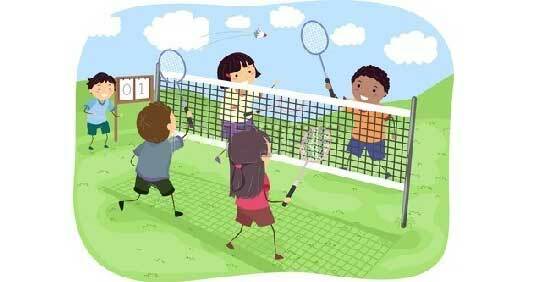 Only things you need to start playing badminton are the badminton court, net, rackets and shuttlecocks. Usually played between two people (Singles match), or four players (Doubles match). Making a badminton court near home is an easy task, but if you want to build everything as per standard measurements, badminton court area size, length, height and rules, you need to spend some time learning – “how to make a badminton court”. In this article you can learn everything you need to know before building a badminton court, including badminton court dimensions, flooring, lighting and setting up of badminton net. A wide open rectangular open space is always a good place to play badminton. It is ok to choose a grassy area, if there is no slope . If it’s a closed indoor place then the ceiling should be at a good height so that the shuttlecock doesn’t get hit the ceiling wall. As we all know, badminton court is rectangular in shape and is divided by the net at the centre. There is marking done for singles or doubles play. 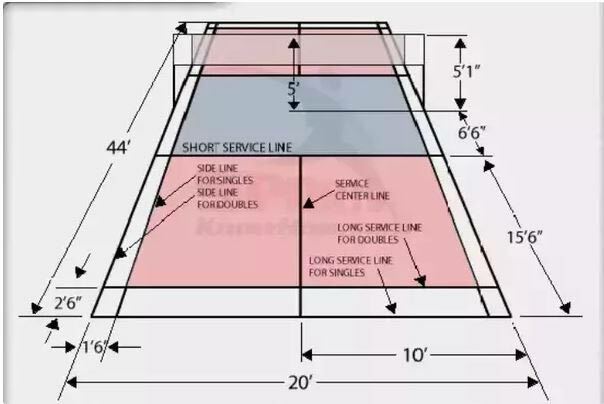 Above video clearly shows the badminton court dimensions, length, width and pole hieght in 3D. Typically the length of the badminton court is 20 feet but in case of singles it is reduced to around 17 feet. You can then use paint or chalk to divide the court into two parts by drawing a line a between the area which you mark as badminton court. Professional badminton court has got specific type of flooring. It is typically taraflex flooring and green in colour. But this is about indoor court. If you are looking to build a court outside in your backyard then it is important to know how much bigger space is available. If the place is small then you will need to draw the margins accordingly. The court should be in the middle. If you have lot of grass then it should be mowed as it is easier to play on a shorter grass. Any kind of rocks should be removed. In case the backyard is of cement then you need to keep the court cooler. The thickness of the lines on the court should be 40 mm, or you can do drawing with a chalk or any kind of powder. The net purchased should be strong, so that it will remain firm even if there is strong wind or rain. Adjust the net regularly after few days so as to adjust the height of it. It is possible that due wind, strong smash shots or some other factors the placement of net might get slightly displaced. The net used can be of vinyl, nylonor polyethylene. The net should be of 5 feet height from the centre of the court and 5 feet 1 inch at the extreme ends. The depth of net should be 2 feet and 6 inches. In terms of width, it should be 6.1 metres wide. Thickness should be around 15 to 20 mm. A dark colour of the net gives good visibility of the shuttlecock. So the net cords should be of dark colour. Pole height is 1.55 meter. You can draw the boundaries of the court by using a duct tape. You can even use a stick to draw the lines. If you often play badminton in the night then arrange for LED flood lights of around 400 W. The LED pole light height should be around 8 to 9 meters.